Euro Tour. Week 10. Germany. This weekend it was off to the northern German island of Fehmarn, where the “SUP World Cup” kicked off (see what we did there?) with a small but elite field of talent on display. Saturday saw the sprints while Sunday it was the long distance race, with combined results determining the overall event placings. Despite the small field, there were still a few seriously big names battling it out this weekend. In Saturday’s sprints the Kai/Connor rivalry clicked into gear straight away, with the two young superstars locked in a duel right to the line. Kai narrowly took the honours on day one, however Connor had other ideas for the distance race on day two. If you’re not familiar with the SUP World Cup, you should be: This is the old “Jever SUP World Cup” that kickstarted stand up paddling in Europe way back in 2009. It took a hiatus for a couple of years but returned to its original home of Hamburg last year. This year the event had a rather unfortunate change of dates and location, moving back from June to July and sending the race north to the island of Fehmarn. The new location seems to work well but unfortunately the new dates significantly reduced the size of the elite field (this event was originally set for the weekend after the massive Lost Mills race, which would have made for an awesome double header, before organisers decided to change dates to the weekend before Molokai – not the greatest timing). 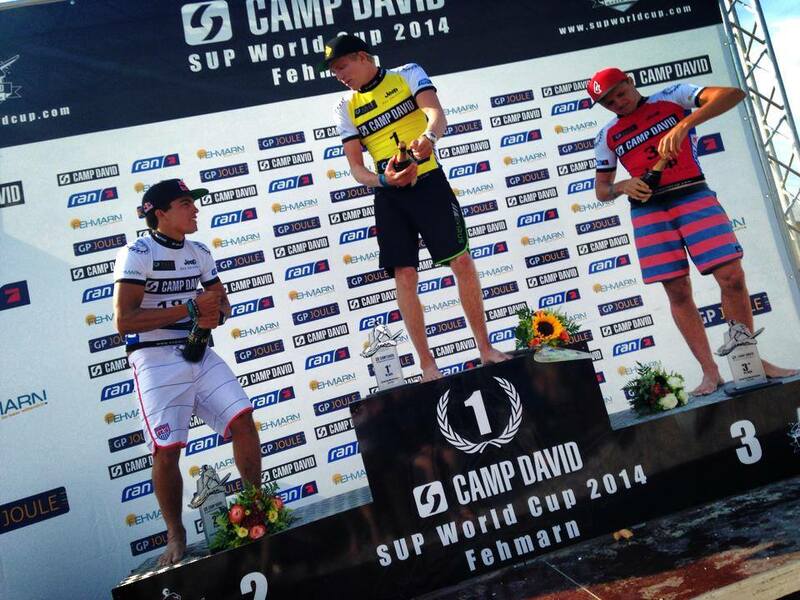 But still, the 2014 SUP World Cup managed to attract several of the leading young guns back to Germany. Plus seeing this event was also stop #3 of the 2014 Stand Up World Series, it was no surprise to see the likes of Connor Baxter, Kai Lenny, Jake Jensen, Zane Schweitzer and co make the trip. But anyway back to the racing action: In the sprints it was all Kai and Connor. With a slight breeze causing the draft trains to break up, the men’s final saw a familiar battle between these two young superstars. Connor led for much of the race before Kai made his move in the closing stages, pulling slightly clear on a tiny bump to record a narrow victory over his Maui sparring partner. Behind was Jake Jensen, while Zane Schweitzer and Casper Steinfath rounded out the top five. On the women’s side, the current ISA World Champion Lina Augaitis was in a league of her own, finishing too strong for France’s Olivia Piana. So Kai went into Sunday’s distance race sitting on top of the event standings, however Connor clearly had other ideas, producing a blistering performance to blow the other guys out of the water. Connor’s finishing time of 53 minutes and 24 seconds was almost exactly one minute ahead of Jake Jensen and Zane Schweitzer, who finished in a virtual photo finish, while Kai Lenny was a further minute back. Post by SUP World Cup. Connor’s win and Kai’s 4th place switched up the final standings, with Connor taking the event title, Kai settling for runner-up and Jake Jensen rounding out the podium. Zane had to settle for 4th place overall, ending his four-event winning streak here in Europe. Casper was consistent again today, finishing in a sprint to the line with Eric Terrien, who himself made up a few spots today to claim 6th overall. After dominating yesterday’s sprints it was no surprise to see Canada’s Lina Augaitis take the win again today, making it a clean sweep of the weekend. Apart from the screw up with the dates (and perhaps a slightly over-confident event name), the SUP World Cup genuinely looks to be one of the most superbly organised events in the world. Despite the small field, this will still probably go down as Europe’s second most-competitive race of the year, behind only the Lost Mills (another very well organised event). Interestingly, that means Europe’s two best-organised and most-elite SUP races are now in Germany, despite nations such as France, Italy, Spain and the UK having far more developed racing communities. Just goes to show how well organised the Germans are.